The Bandar Imam Khomeini petrochemical complex is Iran’s largest supplier of petrochemicals for export, generating millions of tons of petroleum-based products every year. Located in Iran’s southwestern Khuzestan Province, the complex is seen in this Overview adjacent to Musa Bay, a shallow estuary that empties into the Persian Gulf. La Latina is a neighborhood located in the center of Madrid, Spain. The area was named after an old hospital of the same name that was founded in 1499. In the lower left of this Overview, you can also see the popular Mercado de la Cebada market, with its six-panel, multi-colored rooftop. Wat Phra Dhammakaya is a Buddhist temple in the Khlong Luang District of Thailand, roughly 30 miles north of Bangkok. Established in 1970, the temple uses modern methods and technology to encourage a revival of traditional Buddhist values. Its methods have stirred controversy in Thailand and even caused the ruling military junta to temporarily lock it down in 2017. Vineyards line the foothills of the Andean Mountains in Chile’s Valparaíso Region, roughly 55 miles (88 km) north of Santiago. Grapes grown in this wine region, called the Aconcagua Valley, are often irrigated with snow melt from surrounding mountains and have produced red wines of international acclaim. The Arc de Triomphe is located at the centre of 12 radiating avenues in Paris, France. Because of numerous delays, such as the abdication of Napoleon, construction of the arch took nearly 30 years to complete. Check out this incredible shot of a cargo ship in Kronstadt, Russia, passing through frozen waters of the Gulf of Finland. The record low temperature in this region of the country is −35.9°C (−32.6 °F). The Yarkon Cemetery has been the primary cemetery for the Tel Aviv Metropolitan Area, in Israel, since 1991. In response to cemetery overcrowding across the country, 30 burial towers are being built in the cemetery, each one standing about 70 feet (22 meters) high. These structures are expected to provide space for an additional 250,000 grave sites. 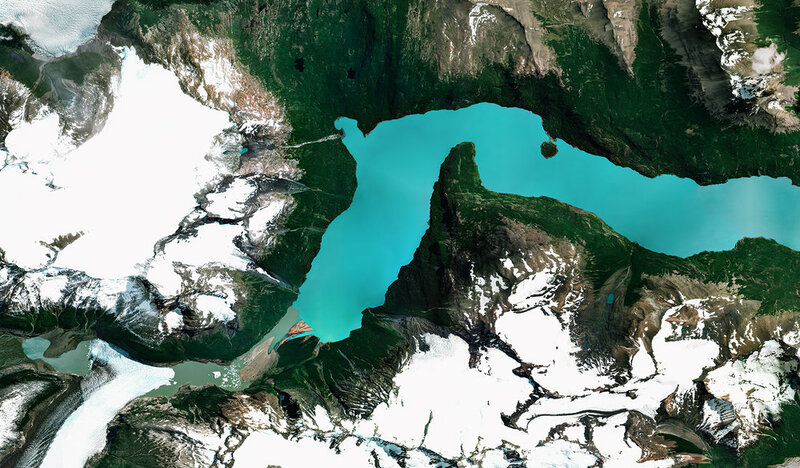 Lago Argentino is the largest freshwater lake in Argentina, with a surface area of 546 square miles (1,415 square kilometers). Located in the Patagonia region on Argentina’s southern tip, it is fed by glacial meltwater from several nearby rivers. Due to its position within Los Glaciares National Park, the lake is also a popular tourism and fishing site. Check out this incredible shot, which shows the eruption of Cleveland Volcano in Alaska’s Aleutian Islands. It was captured in May 2006 by an Expedition 13 crew member aboard the International Space Station. Mount Cleveland is one of the most active volcanoes in the Aleutian Arc, having erupted an estimated 22 times in the last 230 years.